Lee un artículo con consejos de como empezar una rutina de ejercicios. Describe tu rutina de ejercicio en nuestro blog. Want to get in shape? Great! 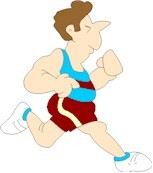 Doctors now believe that exercise is the most important factor in keeping healthy. It can keep your heart healthy, relieve stress, and make you look fantastic. If you're starting a new exercise routine, it's a good idea to start with a visit to your doctor, especially if you're older or have had health problems in the past. Your doctor can advise you of any exercises that you shouldn't do or that you should do differently depending on your health conditions. Don't try to do too much at first. Many people make the mistake of trying to do too much exercise when they begin a new exercise routine. Then their muscles hurt, they get frustrated, and they give up. Start with an easier exercise routine and try to do a little bit more every time you exercise. You'll get stronger and stronger every week. Do something fun! Don't do aerobics if you hate them. Find an exercise or sport that you enjoy and get a friend to do it with you to make it more fun. Try a variety of different exercises or sports to see which one you like. If you like variety, do a different form of exercise every day. Even walking is great exercise! ¿Cuál párrafo habla de lo siguiente? 1. Many people do too much when they start a new exercise routine. 2. Do an exercise you like to do. 3. Exercise is very important. 4. Visit your doctor before you start a new exercise routine. Describe tu rutina de ejercicio o la que quieres empezar. Escribe la "Lección Escrita" en la sección para comentarios abajo. Inglés Mundial es una comunidad de personas que quieren aprender inglés gratis. Ayúdense unos a otros y si ven un error en la escritura de otro, respondan con la corrección. Para aprender de errores comunes, sigue la página de Inglés Mundial en Facebook, Google+, o Twitter.